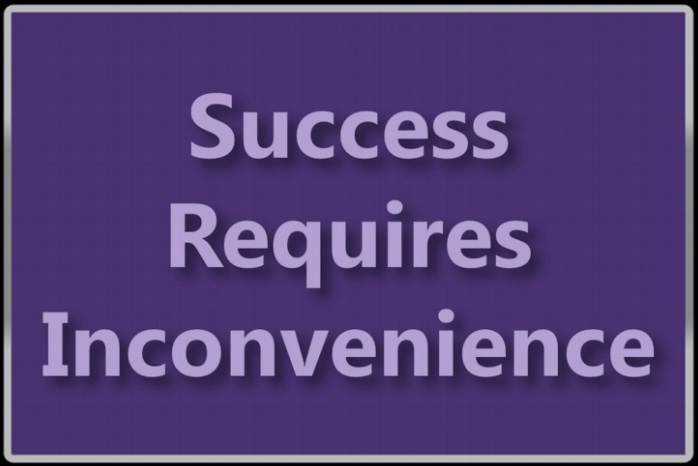 There’s something about inconvenience – you can’t avoid it in your pursuit of success. You have to leave behind what’s convenient to reach your conviction, as Lisa Nichols would put it. Even if you are naturally gifted in certain things, it is only when you work at refining it that you feel a sense of satisfaction. That is especially true if it is a gift that you wish to use to serve other people. Case in point – Spanish is my fourth and favorite language. It was extremely easy for me to learn it as a teenager, and I’ve been fluent in it since before I was 18. I can honestly say that I’ve never acquired a skill as easily learning new languages. For me, things “just click” when it comes to languages. However, the work comes in conveying the mechanics of any language, that’s where the work is. I recall learning how to diagram sentences, something which I was learning the same year I was also immersed in the English language. Three things happened. It opened my eyes to the structure that existed in language. Diagramming set the stage for me to learn not only English, but also other languages, at a much more rapid pace. It enabled me to understand and be able to manipulate words the way only native or near-native speakers can. Sadly, sentence diagrams have been left by the wayside in the pursuit of more “modern” educational methods. Can you relate that to something in your life? There is something you’d like to share with the world. You think the payoff would be sweet, but you think it’s too hard to take those few extra steps. If you’re like me, there are things that tug at your heart, things that you contemplate all the time. Personally, I’m taking the steps to do just that. It felt daunting at first to move in that direction, but now I am so full of excitement, I don’t care how challenging it is. I’m ready. This is the time. I declare that, without needing someone to articulate it for me, or to corroborate my belief. Do those things exist outside your head? Who else has the benefit of it? What are you doing or what will you do to share that with the world? Write down those answers. When things come up that compete for your time, and do not contribute to that passion project, re-read why you must say no. Inconvenience will demand that you develop the courage to protect your dream.